If you are looking to find a good looking, space saving bed with the option of making a real colour statement to impress friends this inspiring bed could be the answer to your prayers. Designed with creative children in mind with room for study, storage and display as well as a great place for a good night's sleep for little ones. The neat fitted appearance of this bed conceals a useful storage area under the bed for bulky things such as suitcases or maybe even just lots of pillows for a secret den area. The main construction of the bedframe is produced in solid pine ensuring sturdy, long lasting quality. Trendy design with full panelled headboards. Pull Out Desk, 4 Drawer Chest and Cube Unit produced in hardwearing MDF. 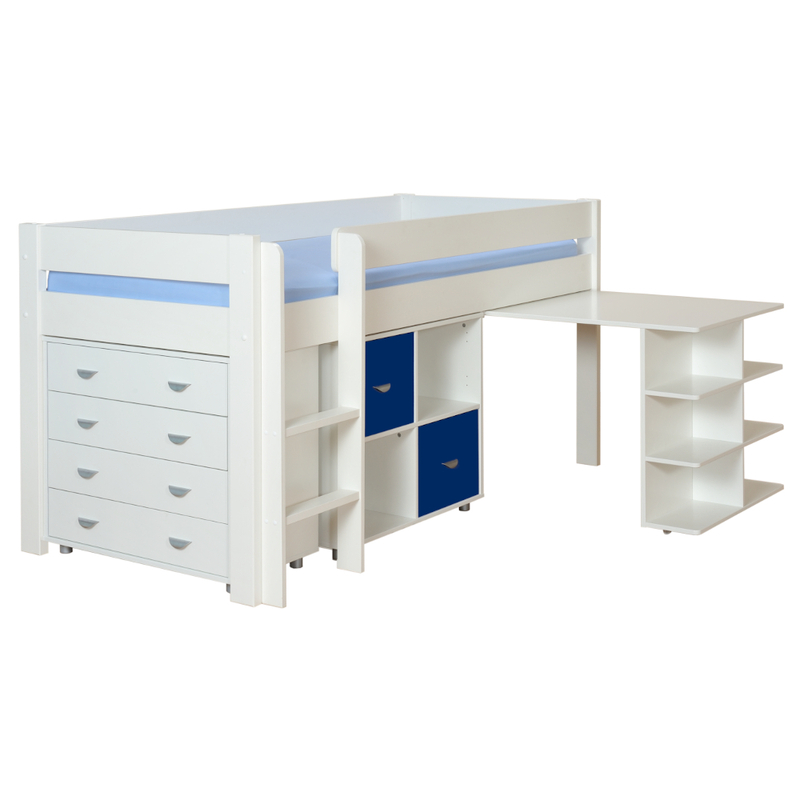 Includes Uno Midsleeper with Pull Out Desk, 4 Drawer Chest and Cube Unit with 2 blue doors. Features Midsleeper bed with Pull Out Desk on castors, 4 Drawer Chest and Cube Unit with 2 doors. Recommended min. age 6 yrs. Size of Midsleeper bed with Pull Out Desk closed H1090xW1255xL2082mm. Size of Midsleeper bed with Pull Out Desk fully open H1090xW1750xL2082mm. Desk pushes easily under the bed leaving only the shelving part extended out from the bed (ca. 200mm). Desk has child friendly rounded corners. Ladder and Desk can be fitted either side. Size of 4 Drawer Chest H719xW799xD399mm. Cube Unit available with white, pink, lime, nero or blue doors for this combination. You decide where to fit the doors. Easy grip brushed steel metal handles on the cube unit.